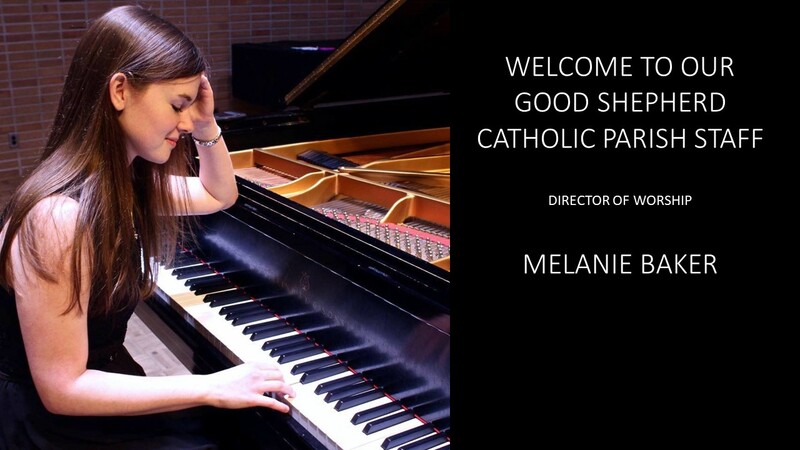 We at Good Shepherd parish believe that our liturgies and worship are enhanced with good, faith-filled music. To that end, we commit our time, resources and energy into making the best music we can with our talented volunteers. We strive for a variety of musical styles that enable us to touch every member of our community. We are always looking to expand our efforts and provide new opportunities for people to join us and offer their gifts to our community and to the Lord. If you would like to be a part of our music ministry, or to simply know more about us, please contact Melanie Baker, Director of Worship, at (812) 477-5405 ext. 255 or mbaker@evdio.org. The Adult Choir brings together singers who share their talents at the 10:30 mass on Sundays, and one 4:30pm Saturday mass each month. We practice every Wednesday evening at 6:30pm in the church. The group answers the call for special occasions, such as diocesan choir events, the sacrament of confirmation, and the liturgies of Holy Week and Christmas. The choir learns music of differing styles and difficulties—including Gospel, Taize, contemporary Catholic, traditional and world music. Much of our music incorporates 2 and 4-part voice arrangements. There are opportunities for solos and duets, as well as cantor roles, depending on the abilities and desires of the singer. The adult choir is open to people high school ages and up. The Children’s Choir gives students in our school the opportunity to minister musically as a choir, and to train for leadership in our parish’s music ministry. This choir focuses mainly on learning the parish repertoire as well as more spirited, contemporary pieces. They minister once every 1-2 months at a weekend mass, as well as every Wednesday at the school mass. Each year, we invite children from grades 3-8 in the Good Shepherd parish and school community to lead us in music on the 4:30pm Christmas Eve mass. Thirty minutes of prelude music precede the mass, with opportunities for solo, duet and small group singing. This children's choir is Good Shepherd's largest music ensemble, and sings a blend traditional and modern Christmas music, along with liturgical music for the mass. Information about practices will be announced at the weekend masses and sent home to school parents each November. The Spirit and Life Choir learns a variety of music, including contemporary Christian and Catholic music, Spanish music, and Gospel. This group incorporates various instruments and singers, and welcomes all musicians from seventh grade through high school and adulthood. They typically minister at one Saturday Mass a month, and practice on Tuesday evenings. The Resurrection Choir brings together singers who wish to minister at funeral masses. These rites typically take place on weekdays at 10:00am. Repertoire is specific to the funeral liturgy, though many selections will be familiar. Please contact Melanie Baker to be added to the mailing or phone list for this choir. The cantor’s responsibilities include leading the music at mass and announcing the hymns to the congregation. Joined by an accompanist, cantors may work alone, in pairs or in small groups. The role requires solo singing on certain mass parts, such as the Responsorial Psalm and Gospel Acclamation. Training and practice time with an accompanist is provided as needed. Interested parishioners in their teens or older are invited to consider this challenging and rewarding facet of music ministry. Please contact Melanie Baker if you are interested in singing for a certain mass, and to be added to the cantor list. God has bestowed upon his people, the gift of song. God dwells within each human person, in the place where music takes its source. Indeed, God, the giver of song, is present whenever his people sing his praises. Singing is for the one who loves. Music is therefore a sign of God’s love for us and of our love for Him.